This cricketer holds the record of smashing century in just 27 balls. He has represented the country in five world cups, including the T-20 world cup. BENGALURU: This cricketer holds the record of smashing century in just 27 balls. He has represented the country in five world cups, including the T-20 world cup. He has kept wickets and been a consistent performer with the bat since his debut for India in 2010. 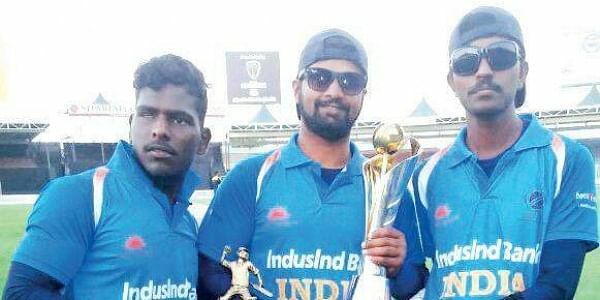 Few cricketers from the The Board Of Control For Cricket In India (BCCI)-sponsored Indian cricket team can match the achievements of this partially blind cricketer from Karnataka. But the state government is least bothered about his plight off the pitch. Born in a poor family, the vice-captain of Indian blind cricket team Prakash Jayaramaiah from Channapatna has been waiting for a government job for the past eight years. But except assurances and formal congratulations, he has received nothing else.“Since 2010, we have been getting assurances from the ministers and they have also made public announcements. I personally have run from pillar to post asking for help, but no one has responded,” says Prakash. His teammate Sunil from Karnataka, who is a son of daily wage labourer, also expects that he will get a government job someday. “I need to help my family financially. All we get is assurance and nothing else.” This was Sunil’s first appearance in the recently concluded World Cup, which India won. Sunil was the man of the match in the finals against arch-rivals Pakistan for his scintillating 93 runs off 67 deliveries. “I really don’t understand why blind cricketers are neglected. They should be given more attention than other cricketers. There are four people in my family who are blind. I wish I could get some assistance to take proper care of them,”said Basappa Vadgol from Karnataka, whose sight is completely nil. He was also a part of the World Cup winning team. Basappa works as a First Division Clerk at a gram panchayat office in Belagavi district but he achieved this by appearing as a normal candidate in the exam. When contacted, minister Pramod Madhwaraj said that they had given `7 lakh cash reward to the cricketers after the T-20 World Cup. “For jobs, we have already written a letter to the DPAR. The Cabinet has to approve the decision,” he added. Born in a poor family, Basappa is blind since his birth. He is third among five children and four of them, including Basappa, are blind. Basappa has also completed graduation from Karnataka university. Sunil (19) was born with eyesight. His parents are daily wage labourers. When Sunil was 11, while playing cricket, a sharp wire pierced his right eye, causing intense damage. With all the pressure on his left eye, he now feels that his sight is slowly diminishing. He is now pursuing a degree in Mountain View College in Chikkamagalur, and is in the second year. Prakash lost his eye when he was just three-month-old when a kid playfully pierced both his eyes with a sharp pin. His parents - Jayaramaiah and Jayalakshmamma - couldn’t afford treatment then. A few days later, his father, a lorry driver, met with an accident and had to stop driving. His mother worked as a tailor and was the breadwinner of the family. When Prakash was 8, they could finally afford the surgery after which he got partial vision.